You've made the decision: it's time to start eating better. You'd like to start being healthier and happier, and you're ready to make decisions that will support that. But it's easy to get stuck on what to do next, because you're suddenly faced with a number of choices: what needs to change in your eating habits? What do you need to start eating? How do you fit those new habits into your busy schedule? What's really the healthiest thing you can do, right now, to start making better choices about what goes into your body? It's easy to get lost, once you start filtering through all the information and advice out there, and even easier to get discouraged. Eating healthier doesn't have to be hard. Some of the healthiest steps you can take don't involve learning new recipes or changing your whole diet – they involve sitting down and taking a few moments to consider what you're already doing now and how it can be improved. Start by writing down everything you've eaten for the last three days, so you can work out your patterns. Pay attention to when you eat, in addition to what you're eating - knowing what kind of eater you are allows you to tailor your plan to your approach to eating. Getting an understanding when you snack, and what you're eating, is as important as what you're eating for breakfast, lunch, and dinner. Once you've identified your patterns, start looking ahead. Take all the slots you need to fill - breakfast, lunch, dinner, morning tea, dessert, post-workout snack - and fill them with meals/snacks and drinks and all the details. Put together a shopping list based on your plan, before you do the grocery shopping, so you can be sure you have all the ingredients you need. The initial goal here is to focus on what you're eating and drinking, rather than making immediate sweeping changes to your diet. Being conscious of your eating habits gives you the power to start identifying places where you can make small, easy alterations to your weekly routines by swapping out a particular meal or snack. It also starts the process of making choices about your meals before you hit the supermarket. Focusing on your shopping list, rather than making choices about what you'll be eating when you're pushing a trolley down the aisles, makes it easier to stick with your plan. Want more information about building a healthy eating plan? The Healthier. Happier website has more advice and a weekly meal planner template. Eating healthy isn't just looking at what you're eating, but also how much you're consuming every day. A healthy meal isn't a green light to consume as much as you want, because even the healthiest food can result in weight gain if you eat it in large quantity. The average energy intake has increased significantly for adults and children alike since the 1990s as the size of our meals has increased. Portion creep has been particularly prevalent in fast food, but it can happen when we cook at home just as easily. We subconsciously attempt to adjust our servings to fit the size of our plates, rather than our level of hunger. Research shows that bigger plates and glasses lead to people eating and drinking more. Making healthier choices can start with buying smaller plates to use at home, being mindful about your eating, and learning to say no at the fast-food counter when you're asked, "would you like to make that a meal?" If you'd like to get a better grip on what standard portion sizes should be, try the portion size quiz at the Healthier. Happier. website. After thinking about what you're eating, and how much of it, it's time to start looking at what's in each meal. When you look for ways to improve your eating plan each week, breaking down what your body needs is a great way of identifying the points where you most need to make a change to your eating. Nutrition 101 tells us that we burn a certain amount of energy every day, and draw energy from the food and drinks that we consume. Both are measured in kilojoules and the math starts with a fairly simple equation: if we eat more kilojoules than we burn, it results in weight gain. If we burn more kilojoules than we take in through our eating, we lose weight instead. Healthy eating starts with being aware of your energy requirements, but it also means looking for a wide variety of nutrients to help keep the body running. All those things you learned in school about the five basic food groups? The breakdowns are still relevant to your life today, and there are plenty of refreshers online if you need a reminder. Just as you should start looking at your future eating plans with energy requirements in mind, each new plan is also an opportunity to look at which of the five food groups you need to eat more of (or less of) as you move towards a healthier approach to eating. Keep in mind that the exact building blocks will vary from person to person, so it's worth taking the time to find out what your body needs. While the bulk of your energy should come from vegetables and grains, the recommended serves per day will vary slightly based on your age and gender. Similarly your exact kilojoule needs will vary depending on your age, weight, gender, and level of activity. Healthier. Happier. is set up to give you all the information and support you need to get healthier and happier. 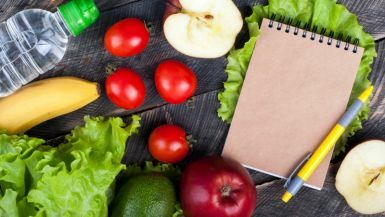 You've already taken the first step, so why not find out just how healthy you are right now or start sorting through some of the facts (and fictions) about making healthier choices about food.